Parents and grandparents are spending more than ever on kids and kids are spending a record amount of their own money. 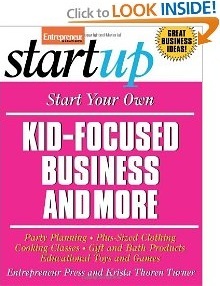 With this Entrepreneur Magazine Start Up series book you'll learn about ever-growing market in kids businesses. You'll learn details about how to carve out a specialized niche in one of these businesses. Each of the following kids businesses - party planning, gift and bath products, educational toys and games, plus-size clothing, and cooking classes - is covered in depth in separate chapters of the book. There's no shortage of potential customers in this industry: According to the Federal Inter-agency Forum on Child and Family Statistics, more than 73 million children under age 18 live in America, and this number is growing every year. Birth rates in the 80s and 90s were the highest recorded since the end of the famed baby boom in 1964. By 2020, the number of children is projected to reach 80 million and to account for approximately 24 percent of the U.S. population. The size of the kids population is good news. So is the fact that parents and grandparents are spending more money than ever on children. Most compelling of all, however, is the surge in kids own purchasing power. Because of changes in the social and family roles of children, recent decades have seen sharp increases not only in kids direct spending but also in their influence on household spending. In the 1960s, an era when kids were largely expected to be "seen and not heard", children influenced an estimated $5 billion of their parents purchases. Kids now influence upwards of $500 billion in household spending, including food, toiletries, and a host of other items (even the family car!) outside the traditional realm of kids products. So how much do kids spend on products for their own use? According to research conducted by American Demographics magazine, 4 to 12-year-olds spend more than $40 billion, while teenagers (ages 12 to 19) spend $155 billion of their own money. There's no question children have more money of their own than ever before - and businesses know it. Children today are the subject of an unprecedented marketing blitz, not only on TV, but also in school. According to the American Psychological Association, Madison Avenue spends more than $12 billion a year on marketing to children. Child psychologists estimate that the average child sees 40,000 advertisements each year, and that the average 3-year-old can identify 100 brand logos. What does this mean to you? Children are savvier consumers than ever before. They know what products and toys are out there. To make sure your business will stand out in this marketplace, you have to be sure you're producing something that kids want - and that means doing lots of research. Let's start with the following overview of the five kinds of kids businesses profiles in this book and the trends shaping each of their industries. In the next chapter, you'll find out more details about how to carve out a specialized niche in one of these businesses. Each of the following kids businesses - party planning, gift and bath products, educational toys and games, plus-size clothing, and cooking classes - is covered in depth in separate chapters in this book. For now, here's a quick industry analysis for each.